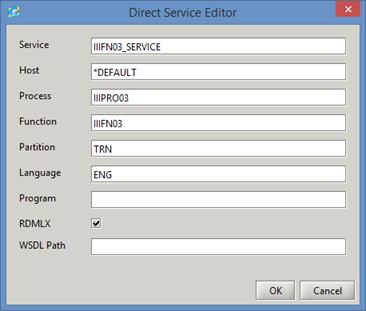 In this step, you will use Integrator Studio to define a Service and add an entry for your service and server function iiiFN03 name. 1. 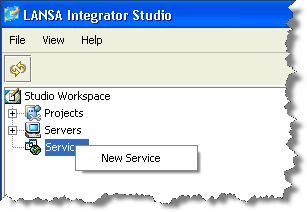 Open Integrator Studio and select Services and right click to define a New Service. 2. Define the service URL and Port. If you are using a local Windows web server and JSM server this could be http://localhost:80. 4. Enter a name for the service. 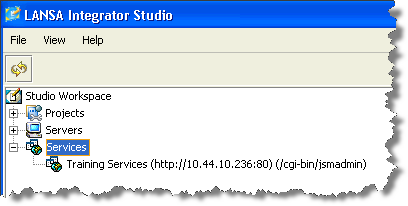 This name is internal to Integrator Studio and does not need to be unique. You do not need to use your initials iii. 6. Select the service and using the right mouse menu select Open Service. 7. 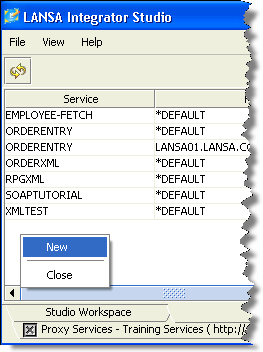 The entries shown will depend on what services (if any) have been defined for the JSM Server you are using. 8. Right click on white space and select New. 9. Enter suitable values for your process, function and partition as shown. Select the RDMLX check box, and click OK.
11.If your service is using a Windows web server and JSM server, file DC_W29.txt has been updated. If you are using an IBM i JSM server, file DC@W29 in library DCXJSMLIB (or your equivalent) will have been updated. The User Agent will now be able to call this service and it will resolve to a call to your function iiiFN03.